The BioTek Microflo Select Microplate Dispenser provides you with universal microplate dispensing, with adjustable height and high volumes, allowing you to accommodate far more than the typical reagent dispenser. This Plate dispenser accommodates all standard well formats, deep wells, and even test tubes under 4 inches, and has a volume range of 1µL up to 10mL depending on the cassette used. This digital plate dispenser can dispense instantly for most common applications, and saves the 10 most recently used routines to be called up quickly for repeat performance. In addition, parameters such as volume, dispense rates, plate type and maps can be adjusted on the fly. The unique attribute of this plate dispenser and its flexibility come from its adjustable horizontal dispenser position, for precise positioning no matter the format. The BioTek Microflo Select Microplate Dispenser can be operated directly from the user-friendly membrane keypad, or partnered with optional PC controlled software for added flexibility and automation. This reagent dispenser is Biostack Compatible, and can also be paired with a BioStack Twister II microplate handler. The onboard microprocessor will store up to 99 user-defined dispense protocols for a wide range of dispensing capabilities. 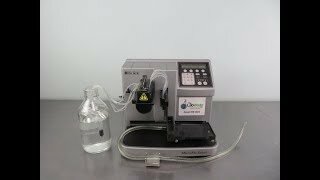 The peristaltic pump of this plate dispenser can draw from up to 8 different supply bottles into various vessels, and uses 4 rollers over which tubing is stretched. Test Tube configurations up to 4"
Please note cassette seen in pictures is not included. This is our test cassette we used to QC the instrument. This BioTek Microflo Select Microplate Dispenser has been fully inspected and comes with a clean bill of health. All of our lab equipment comes backed with our standard warranty. Please note cassette seen in pictures is not included. This is our test cassette we used to QC the instrument. Should you have any questions, please don't hesitate to contact us.